January | 2015 | Dare Greatly! Everyone knows that we should all be drinking more water; however, the actual doing of it leaves a lot of us at a loss. For me, the big hang-up seems to be keeping track of how much I’ve drunk. It’s all well to say, “I’m going to drink X amount today.”, but the fact is that after a while it all sort of runs together in my head. Hence, my latest project: the water counter. They have counters made from paracord and pony beads for almost everything, but I’ve never seen one for this. It isn’t anything fancy or complicated. You simply slide a bead down for every container of water you drink that day. So far, I’ve drunk one and need a refill. It also gives me a heads up to where I should be depending on the time of day. That’s a big one for me because as I said, I always start off with the best of intentions and then I’m like: “Did I drink one… No, I refilled it… Or was that BG’s water bottle?” Of course you could just go with the theory: drink more, but hey… It’s pretty, too! On the practical side, you could use whatever kind of beads and cord you wanted. 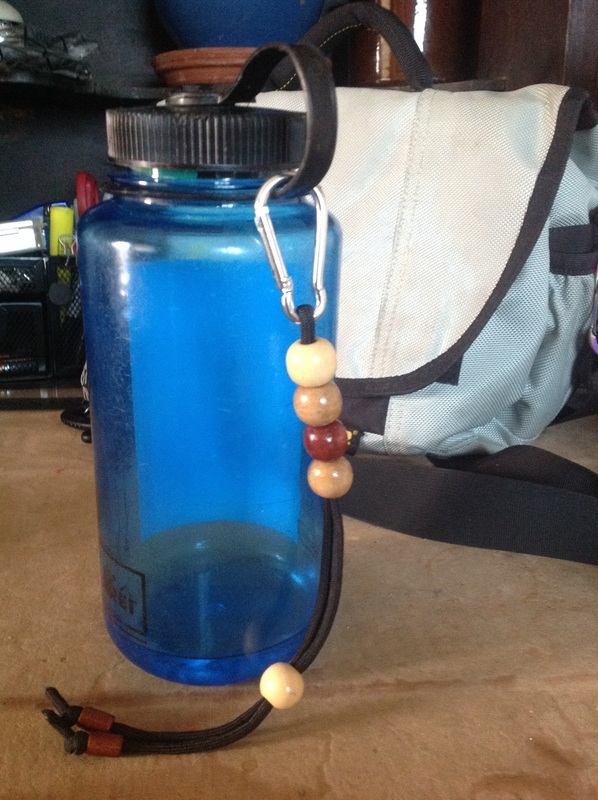 I thought of making one for my friend with big chunky crystal beads because that’s more her thing and she’s always lamenting the lack of bling on her water bottle. Also it makes a great leash for dragging the thing around. Let me know what you do with it and if it works for you!